When DDF claims to be the best at what they do, they have a world champions’ trophy to prove it. They are to rope skipping what Brazil are to football – undisputed masters of their craft. 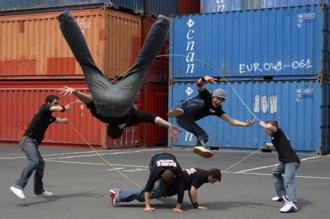 Dance and acrobatics, balance and style all come together as this unique urban act perform choreographed routines on, in, round, between and through a pair of swirling jump ropes. DDF combines the street energy of breakdance with foot-tapping rhythms to bring astonishment – and a smile – to any audience. DDF is entertainment for everybody, for young and old. The reference list is long: music videos, commercials, conferences, parties, discotheques, festivals, corporate events ... The crew is becoming a legend in the world of urban entertainment.